Dalila Parra es Periodista Comunitaria de ‘Tu Voz Digital’ y nos trae una conversación con la maestra Pat Bonilla que se ha dedicado a enseñar inglés como segunda lengua a adultos por muchos años. 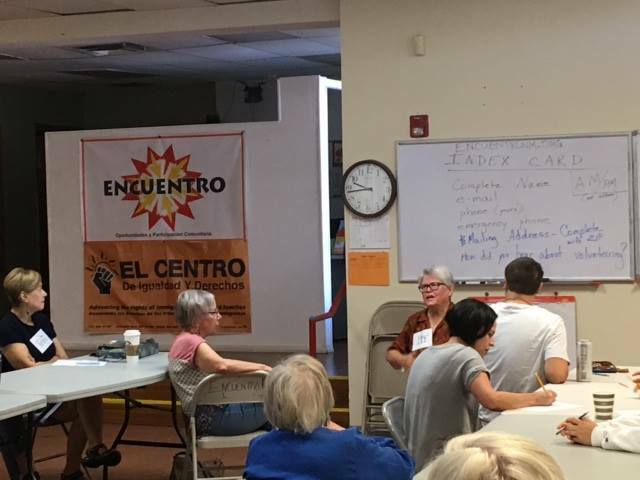 Ha empeñado sus mas recientes a estudiantes de Encuentro, escuchen porque se ha quedado dedicada a la comunidad inmigrante de Albuquerque en Encuentro. Dalila Parra, community journalist from Encuentro, interviews her former English teacher Pat Bonilla who has been with the organization since it opened about nine years ago. Pat has been a teacher for over 40 years now and when Andrea Plaza, Executive Director, prompted the idea of hiring her as a part time English teacher, Pat found it in her best interest due to the fact that at the same time she was taking care of her mother and a part time job was all she could do. Pat was one of the first English teachers at Encuentro. She describes the organization as a community, not just a place for people to take classes. Her relationship to her colleagues and students is similar to a familial bond, which is what drives her to continue prospering as a teacher. Pat explains the pride she feels when her students dedicate their time and energy into taking classes because all of them already have so much on their plate’s as full time workers or parents. Pat is happy to announce that they are preparing for the Graduation coming up at the beginning of May, where students who have completed certain courses get a certificate of completion along with a celebration to acknowledge everyone’s hard work. Pat explains that at the beginning of the semester most of her students couldn’t fathom being able to even have a conversation with someone in English, but now after the hard work and preparation her students feel much more confident in their abilities. Pat is thankful to be apart of such a thriving community and would like to say “Sí se puede!” to anyone who doubts themselves.